This month's cupcakes were really fun to make! I was actually surprised at the simplicity of it. What could be better than homemade Hostess Cupcakes?? In a separate bowl, beat butter and sugar until pale and fluffy. Then add in eggs, one at a time. Add in the flour mixture in batches, alternating with sour cream. I know there are many chocolate cake recipes out there that call for sour cream, but I've never tried it before. It seems like such a weird ingredient to have in a cake, doesn't it? You should get this beautiful and thick chocolate batter! Scoop your batter into greased jumbo muffin tins. Bake at 350 degrees and cool. Meanwhile, prepare the cream filling! MMMmmmm...is it wrong to love marshmallow creme?? Because, really, I could eat it out of the jar all day, every day. But then I'd probably die of heart failure at age 26. lol. Anyway, back to this cream filling. It's super easy to make. You just beat together softened butter and Marshmallow Creme until well combined. SO good! Ok, now we fill them! Ready for this? The recipe says to use a melon baller. But I didn't have one, so I just took a small knife and cut a circle in the bottoms of each cupcake. The little circle of cake lifted right out and remained in one piece. Then I took the tip of the knife and gently carved out some of the cake in the center. The crumbs were really soft and loosened up easily. Then, all you have to do is tip the cupcake and the crumbs will fall out. I was surprised at how easy it was! I was expecting a few failed attempts, but all of them came out perfectly. Fill it with the cream. I just spooned it in. No biggie. Then I replaced the circle that I cut out earlier. Ta-DA! Happy cream-filled cupcakes! Now, turn 'em around to face upward. Fear not! No cake was wasted in this process. These crumbs made it to my happy tummy~! And now, place the rest of the filling into a piping bag and snip off a small hole. No piping tip needed. Check out all that ooey gooey goodness! These didn't taste very much like the real thing but no one really cared! They were suuuper delicious in their own right and got gobbled up almost right away. For those of you who are doubtful/frightened by the Marshmallow Fluff, give it a chance! You'd be surprised at how awesome it tastes! hehe. 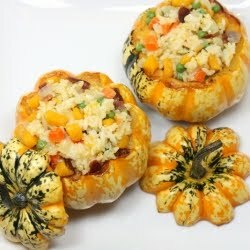 Wow, yours look just like Martha's (or her food styling team's, whatever) - nice job on these! Thanks for baking along with me. Oh wow! How wonderful! And I did need something to take as a class snack on Friday. Though, it may be hard surrendering the whole batch. Maybe I'll just make double the chocolate cupcakes & keep a filled batch for myself! Oh & btw, I didn't owe anything! Actually got a big return. Our tax lady is great! Your cupcakes are perfection Judy! I had a lot of trouble whisking the fluff and the butter together but otherwise, these were super simple. My husband gladly ate a few for dessert tonight! I'm going to dub you the Cupcake Queen! I'd love one of these for breakfast today, but you're too far away so I guess I'll have to settle for a bowl of oatmeal instead. Yummy! Yours look great - much neater than mine! Awesome! I wish that I had used marshmallow fluff sometimes! I had to go out and buy a new jar of marshmallow creme because I'd eaten mine before it could be used in the recipe...so you are not alone in your love of marshmallow fluff. Your cupcakes look yummy. Thanks for showing how you were able to fill the cupcakes because that was something that didn't work too well for me. I love how the marshmallow fluff is oozing from the cuppy!! How did you do that. Yours look fab! I'm glad they were liked. I'm not sure why mine turned out so mediocre. Hmmmm. Great job! I will definitely use the cream filling recipe again, but maybe not the cupcake recipe itself. I love your pictures! The marshmallow filling was the best part of this recipe. I can't tell you how much I would love one of these. We don't get marshmallow in jars here in UK, I really wish we did, these are my kind of cakes! You've made cake with beans and with ketchup, and sour cream sounds like a weird ingredient to you?! lol, silly Judy. Thanks for letting me taste these! I'm happy to be your guinea pig anytime! See ya soon. Hi Judy, It's my first time here and I'm so loving it. You have delicious treats everything looks so yummy. Hurrah! Still posting, I see. They look fantastic Judy. Can't wait to see what's next! thanks for posting those delicious dishes!!!!!! !